Garden tour – Our garden tour includes a tour of our raised beds, all the vegetables we are growing in our raised beds, the soil we use and how we care for our plants. We then look at the harvests we made this month. 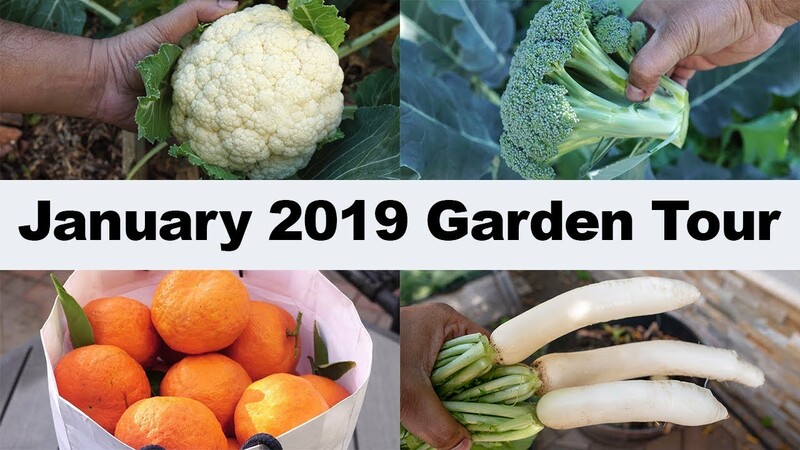 In January we harvested a lot of vegetables like the banana flower, broccoli, cauliflower, moringa, oranges, peas, radish, swiss chard, tangerines and turmeric. We then show you some things in you can do in your garden to make gardening more enjoyable. Activities like pruning your trees, sowing summer vegetable seeds, etc, which will take your vegetable garden to the next level! We then look at some nice gardening products available at your local Lowes, Home Depot, Albertsons and Costco. We announced a seed packet giveaway and chose two winners. See today’s episode to check if you have won! Gardening in Southern California is very enjoyable. In this Southern California Vegetable Garden we give you a Southern California gardening tour as well as show you a lot of harvests.